What a whirlwind few days! It’s now Monday evening (okay, it’s midnight, so it’s technically Tuesday morning) and since my last post, I’ve gone to Brighton, met up with fabulous friends, enjoyed Timey Wimey 7, and made it back to London, so it’s been a busy few days! Totally worth it, though I must say my feet are feeling it just a bit. All the better I’m writing this post from bed! Now then, I didn’t have my laptop with me in Brighton, hence no blog posts (much easier to write them on this than on my iPad or phone), so I’m catching up on both the weekend in Brighton and today after we got back to London. 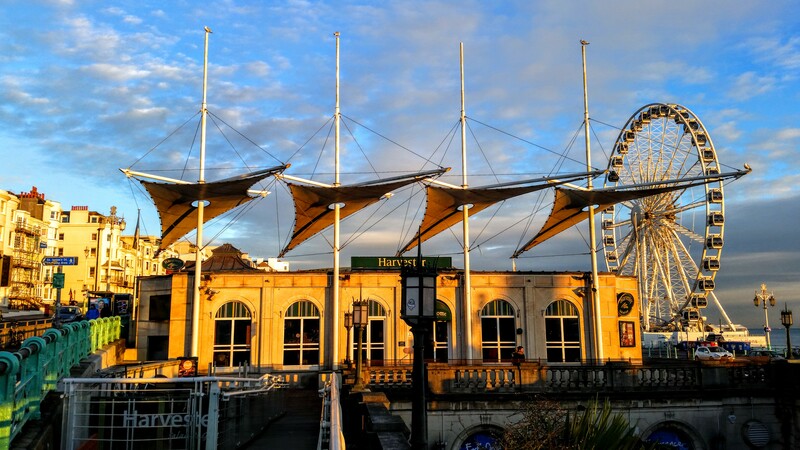 Brighton was everything I hoped it would be, with added bonus sunshine. After arriving around 2p on Saturday, Bill and I happened to meet up with our friends Ally and Nick in our hotel because we were all waiting to check in at the same time. We had a drink with them, but parted ways when our room was ready. We got a little settled in and then walked over to our friend Matt’s place to help him put together the registration packs for Sunday’s event like we did last year (he’s pretty much a one-man-show when it comes to planning this event, so we try to help with these details as much as we can). There were fewer attendees this year (~50 as compared to last year’s 300), so the three of us, along with our friend Neil, made pretty short work of everything, so we spent some time chatting and hanging out at Matt’s for a bit. Neil had other plans, so the rest of us went over to Hove Place for a nice dinner (they’ve got a slightly classier take on pub food and it was all tasty, so pay them a visit!) and then back to Matt’s to watch that night’s episode of Doctor Who. Being in the US, it’s a rare treat to get to watch a new episode as it’s transmitted in the UK, so that was definitely cool. After staying up far too late (sorry Matt! ), it was back to the hotel for Bill and I so we could get rested up for Sunday. As for Timey Wimey, it was spectacular! With far fewer people this year (and with both years’ events being much smaller than the other conventions I go to), it was nice and relaxed and it seemed like everyone had a fun time. If you’ll recall, my job at the convention last year was to be a guest liaison for my friend Sophie, but she wasn’t able to make it this year, so I got to work with my friend Gary instead. He’s spent the last couple of years living in Australia (and will be for awhile yet), so it was fun to catch up with him. 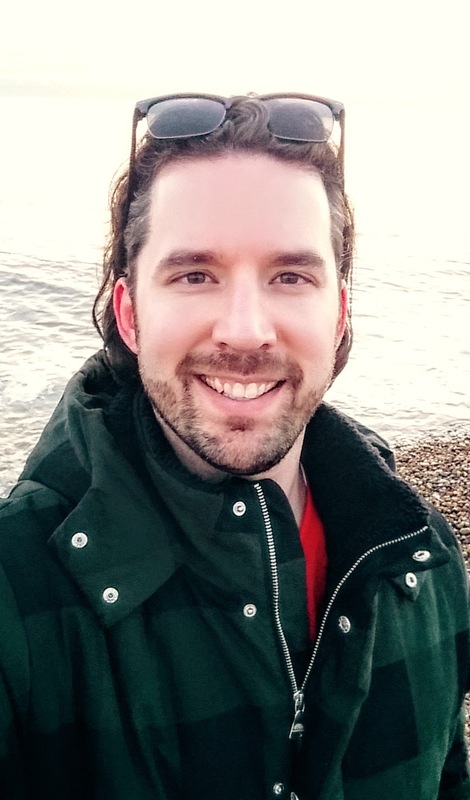 Because the weather was so sunny, I also wanted to get out and walk around Brighton for a bit, so I managed to find some time for that throughout the day as well! Before I knew it, the convention was over and some people went to dinner with another group of us stayed for drinks in the hotel bar. Most of us met up later at a local pub for awhile, but I was walking back to the hotel by about 11p so I could catch some shut-eye. I had so much fun seeing everyone though! As of now, Matt doesn’t have plans to hold another Timey Wimey next year, but I’ll fortunately see many of these friends at other events throughout the next year. 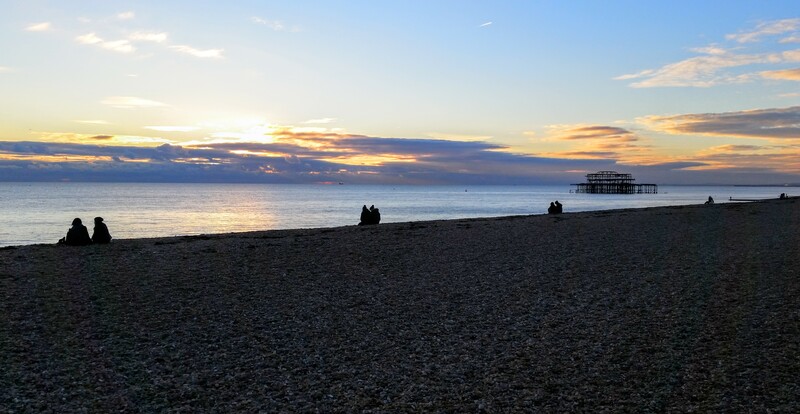 Now, onto the Brighton pictures! 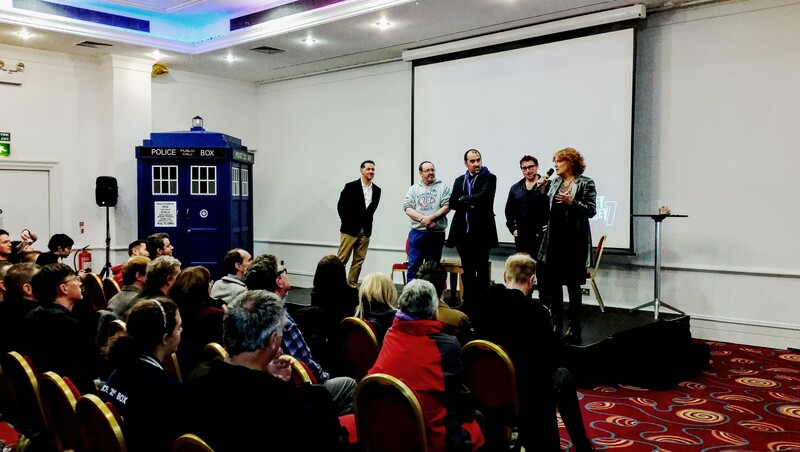 The TARDIS returns to Brighton! 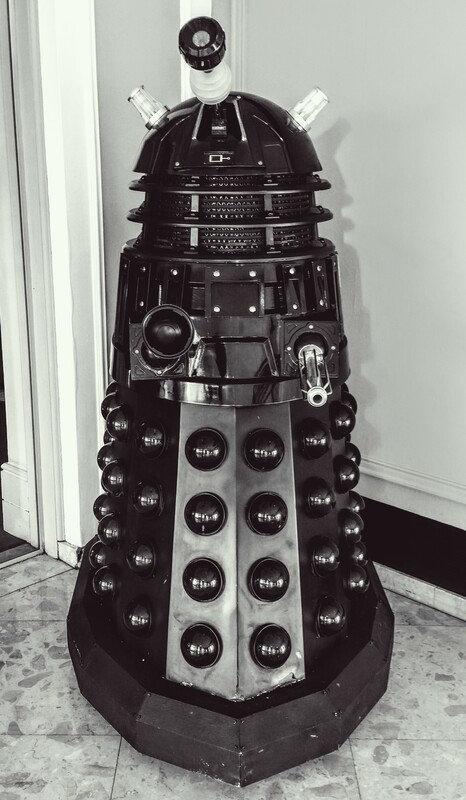 And monochrome dalek, too. 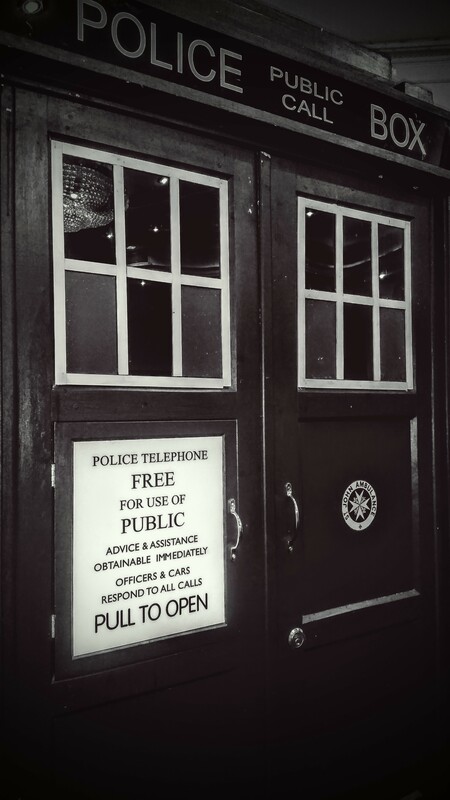 This one was used on-screen in the current season of Doctor Who – cool! 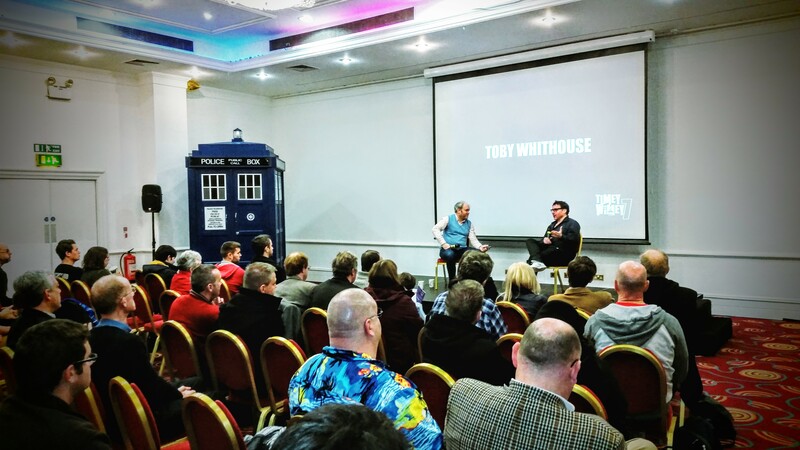 Guest interviewer Toby Hadoke with guest Toby Whithouse. The guests saying goodbye after a fun, relaxed day. 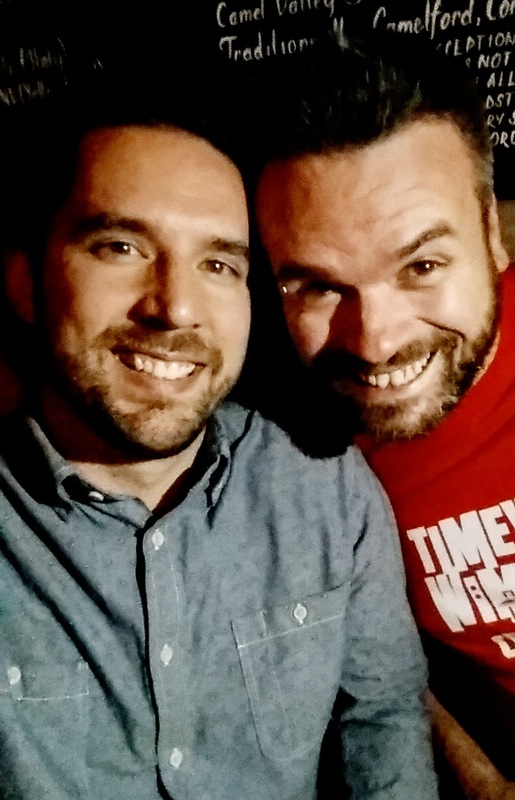 Selfie with my dear friend Steve, who I met 15 years ago this month. 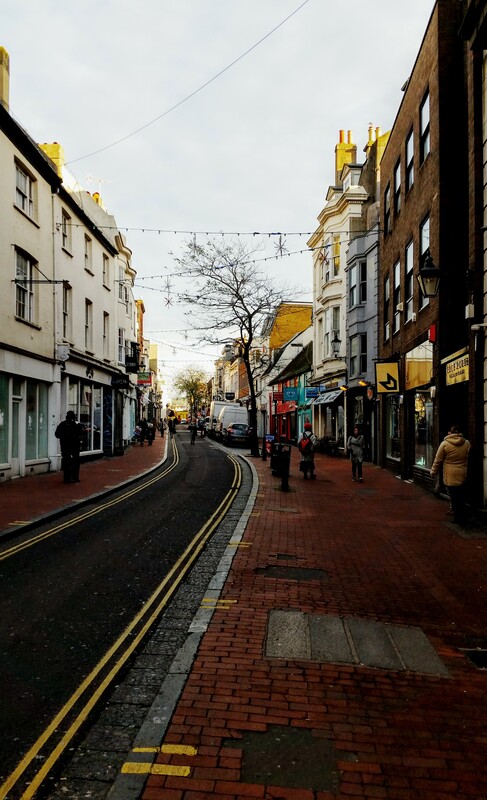 Because of the gorgeous sun, you get several photos from my strolls around Brighton. 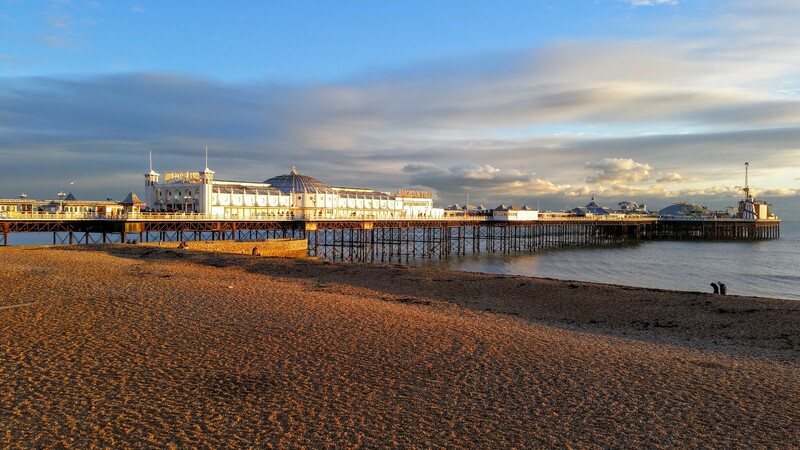 This is Brighton Pier looking spectacular in all that sun. 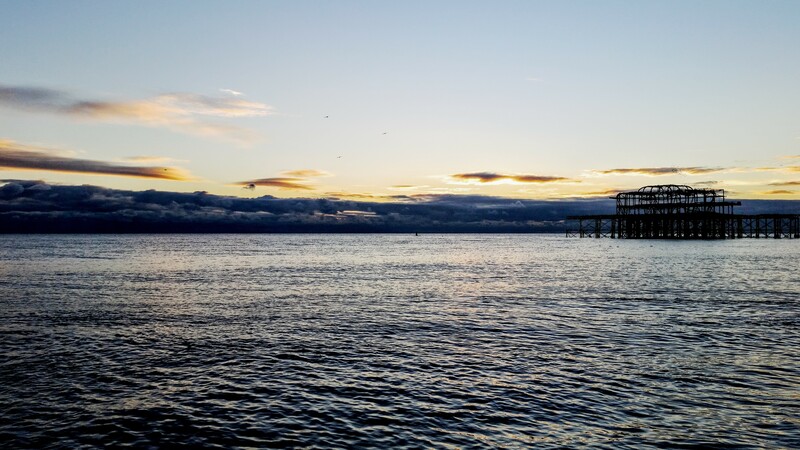 Amazing sunset with the remains of the West Pier on the right. 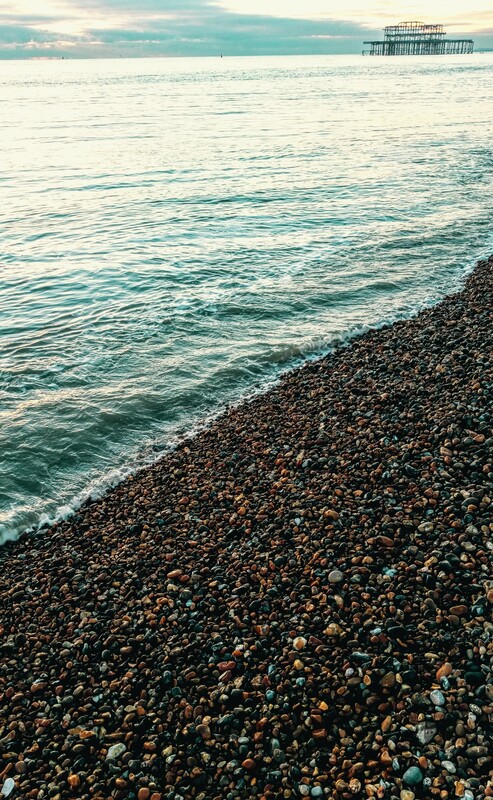 The pebble beaches in Brighton always look so cool (though they aren’t easy to walk on). I love this photo! So cool to see all those pairs of people lined up along the beach, enjoying the evening. 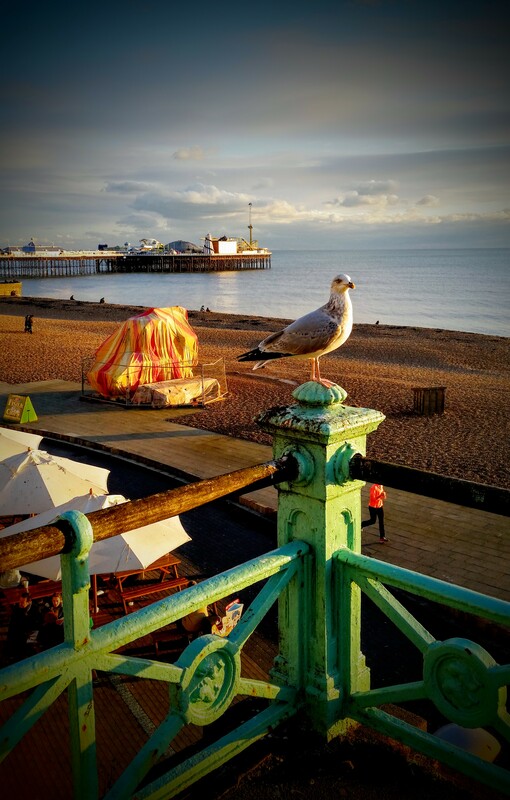 The pigeon and the pier. I haven’t been taking many panoramas on this trip, but this seemed like the perfect place to snap one. In addition to strolling around yesterday, I also got out for a walk before we left this morning. I took this picture looking up one of the streets as I was out and about. 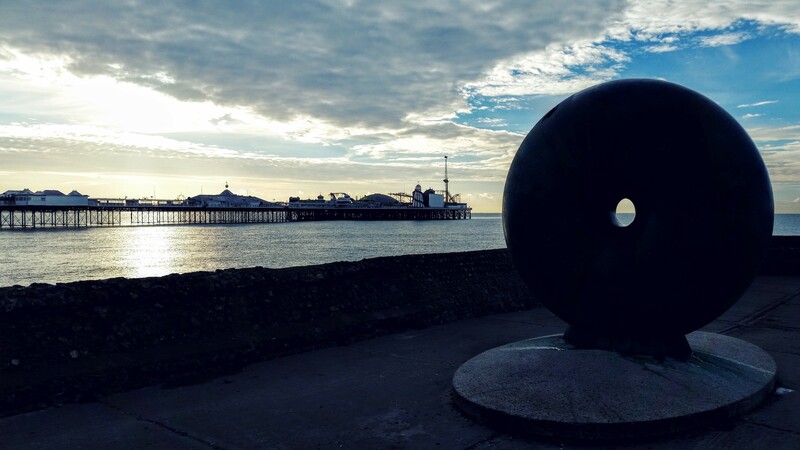 I loved the way the doughnut looked next to the pier in the morning sunshine! So what about London?? We made it back safe and sound, but we didn’t get back to Lewisham for awhile because we stopped by a Save the BBC protest that featured several Doctor Who actors, including Sophie. Because she lives further out of London now, I was afraid I wouldn’t see her on this trip, so I was only too happy (as was Bill) to go along when she told me about it over the weekend (I also want the BBC to have a long, healthy life, so I wanted to show my solidarity!). Because of a train delay, we only managed to catch the last part of the protest, but it was great to see a good number of people there showing their support. We met up with Sophie (and a couple of her friends were also at the protest) and headed to a local café to have a quick catch-up. So glad we got to see her! After catching up with Sophie, we had to get home to drop our luggage. Although Brighton was just a quick weekend trip, we still each had a small bag and it wasn’t very fun carrying them through London (though totally worth it in this case). 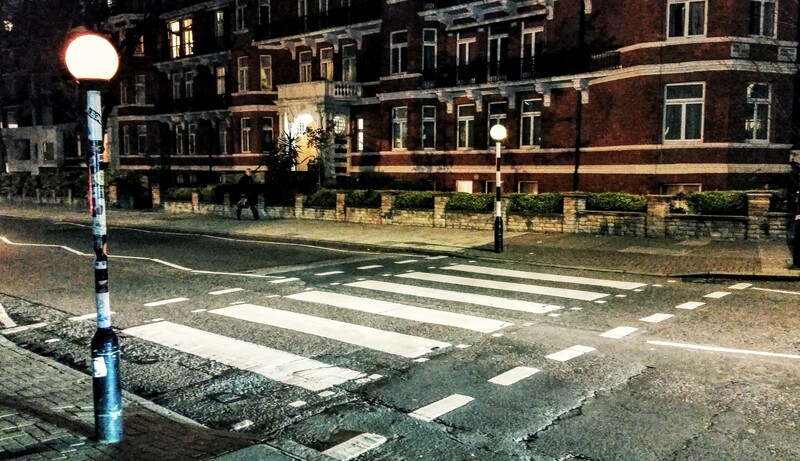 We came home, dropped them, and pretty quickly headed into the city because Bill decided we should visit Abbey Road, which both of us had only done once before. Because it gets dark so early right now, we didn’t see many people when we got there around 445p, but that meant I could get a picture of Bill crossing, which was our main reason for going. I just wanted to get a nice, uncluttered picture of it for myself, which I also managed to do. Win! If you really want to do Abbey Road right, you should have at least five people with you (four to re-enact the way the Beatles walked across the street and another to take the photo), but plan accordingly because there are generally lots of other people and cars there as it’s a pretty busy intersection. If you’re a Beatles fan though, it’s a must-do! 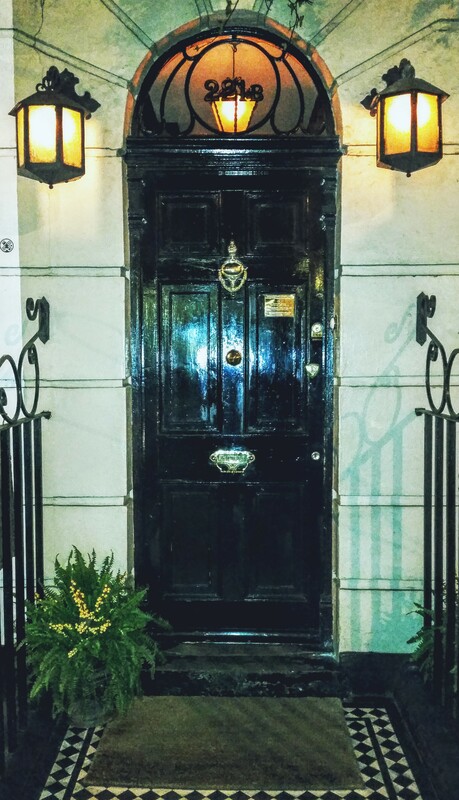 From Abbey Road, we went to the home of Sherlock Holmes, 221b Baker Street. That address is home to the Sherlock Holmes Museum, which we went into, but only to check out the gift shop. One of my brothers is a huge Sherlock Holmes fan though, so if you’re like him, add this to your to-do list. I’d never been before, so I had to at least get a picture of the door (see below). From there, we caught the tube to Charing Cross (very easy to get back to Lewisham from there, so we were planning ahead) and then walked up to Forbidden Planet for a quick shopping stop. Alas, nothing caught my attention, though it’s a fun store to visit and Bill bought something, so it was worth it. If you’re into any kind of cult, sci-fi/horror show/movie (Doctor Who, Star Wars, Star Trek, Hammer horror stuff, Walking Dead, etc. ), you should definitely stop by and do some shopping. By the time we were done at Forbidden Planet, we were close to self-cannibalism (well, maybe that was just me), so we decided to find somewhere to eat. After a few minutes of wandering and Googling, we came across Wildwood Kitchen, which looked to be a tasty Italian place. And tasty it was! Both of our meals were delicious and I would definitely go back. The prices were reasonable too, so check them out! Only a few pictures from the London part of the day, but enjoy them nonetheless! 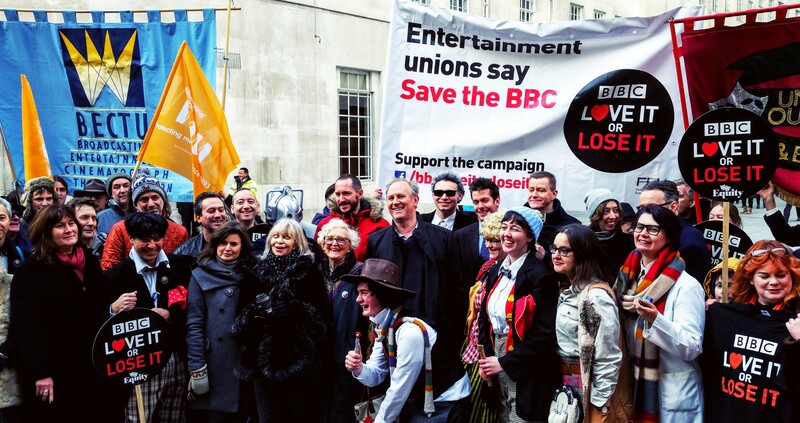 Doctor Who actors Sophie Aldred, Katy Manning, and Peter Davison, as well as costume designer June Hudson and others were on-hand for the protest. 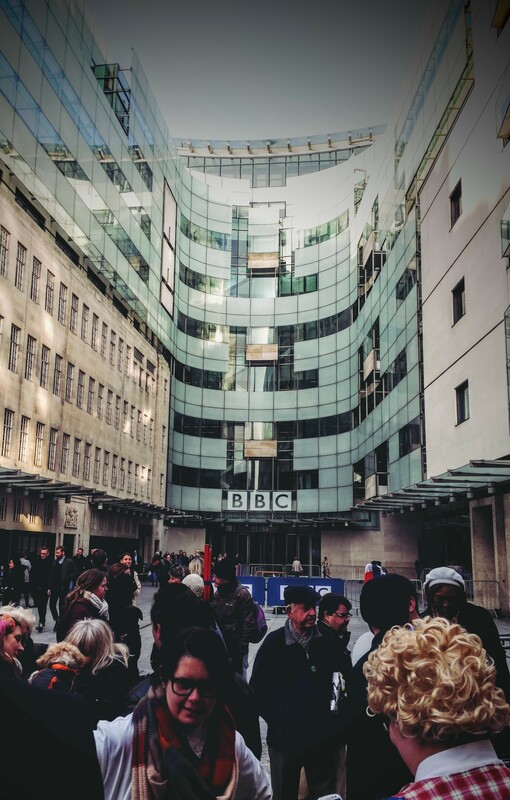 The protest took place in front of BBC Broadcasting House, which I’d never seen in person. Even though the morning was spent either in Brighton or on a train and we didn’t start out with any definite plans for our time back in London, it sure felt like a full, tiring day! Bill is flying home today (it’s now after 1a, so I can definitely say that! ), which is a bit sad, but I’m still here until Thursday morning, so look for more posts between now and then. 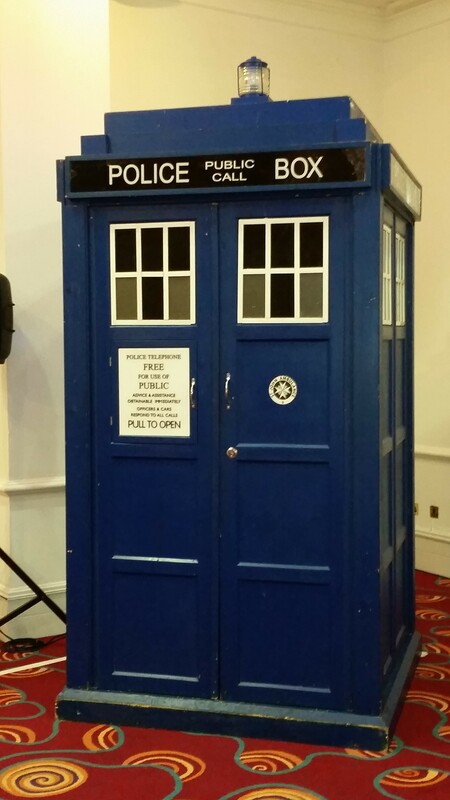 And of course, I’m going directly from here to Chicago TARDIS, so there will be more fun to had throughout the week.